BROWNWOOD – The University of Mary Hardin-Baylor football team used a record-setting performance to clinch a postseason berth as the Cru raced to an 84-13 victory over Howard Payne University Saturday afternoon in Brownwood. UMHB improves to 9-0 overall and 4-0 in American Southwest Conference play with the victory. The Cru also locks up at least a share of the ASC title and guarantees itself the league’s automatic bid to the NCAA Division III National Championships with the win. The loss drops the Yellow Jackets to 4-5 overall and 1-3 in ASC play on the year. Duane Thompson opened the scoring with a 12-yard run to cap the opening possession and make it 7-0 just 1:32 into the game. Trey Thedford’s interception set up Malcolm Miller‘s 13-yard scoring run to push it to 14-0 and Blake Jackson hit Kamray Runnels with a nine-yard TD strike in the corner of the end zone to give UMHB a 21-0 edge. Zarron Dove’s two-yard run cut the gap to 21-7, but Thompson added a two-yard touchdown run to put the Cru on top 28-7 at the end of the first quarter. Runnels hauled in a ten-yard TD toss from Zach Anderson, Michael Carpenter scored on a two-yard run and Anderson threw a 13-yard touchdown pass toDamon Thomas to make it 49-7 UMHB at halftime. The Yellow Jackets scored on the opening possession of the second half to move to within 49-13 and converted an on-side kick. HPU drove inside the Cru ten-yard line, but Eric Allen intercepted a pass in the end zone and returned it 100 yards for a UMHB touchdown to make it 56-13. Thomas added a ten-yard run, Robby Seybold broke four tackles on a swing pass from Jackson to break loose for a 38-yard TD, T.J. Josey scored on a four-yard run and Carpenter broke free for a 56-yard run to close out the scoring. UMHB set a new school record and the second highest total in ASC history with the 84 total points and Allen’s 100-yard interception return broke another school record and tied the conference mark. The Cru rolled up 580 yards of total offense and held the Yellow Jackets to just 260. 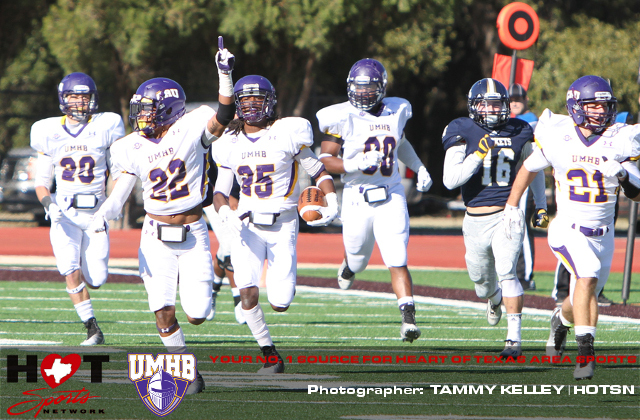 UMHB also tied a school single-game record with six interceptions. Carpenter ran for 101 yards and two touchdowns and Thompson added 92 yards and a pair of scores. Anderson was 12-16 passing for 161 yards and two touchdowns while Jackson went 7-8 for 106 yards and two scores. Runnels finished with five catches for 80 yards and two scores. Cameron Moore was credited with a career-high 11 tackles to lead the Cru and Allen posted 10 stops to go with his interception return. Richard Young was 10-24 passing for HPU for 137 yards, but was picked off five times. Colby Mica caught five passes for 110 yards and Eduardo Nunez posted 11 tackles to lead the Yellow Jackets. UMHB has now won 53 consecutive regular season games and 36 straight ASC contests. The Cru will advance to the postseason for the 11th straight year and UMHB locked up at least a share of its tenth consecutive ASC Championship with the win. The Cru will return to action to close out the regular season next Saturday with a 1:00 PM kick off at East Texas Baptist (4-5, 1-3 ASC) in Marshall. The 32-team field for the NCAA Division III National Championships will be announced on Sunday, November 16th at 5:00 PM Central Time.